Seriously, this is getting embarrassing! This week I rid our apartment of another 89 items, bringing our grand total to 1,105 items. I am quite sure we will reach 2,000 to 3,000 items before our house is fully decluttered. Yikes! This week, some items were more from my eBay business that will not sell. 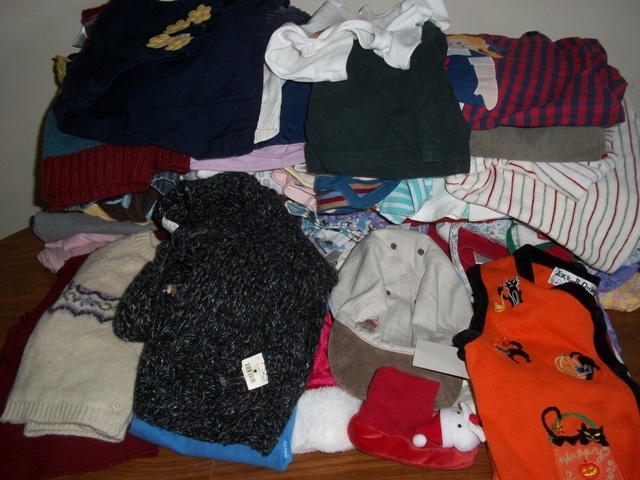 The rest are my kids’ outgrown clothese that are not in perfect shape to sell on eBay. I switched out their winter clothes for their spring/summer clothes, so it was a perfect opportunity to weed through the outgrown clothes. My oldest daughter also had way too many dresses she had outgrown. I saved some for my younger daughter this summer, but I put the ones I just don’t really like in the garage sale pile. Have you been decluttering? If so, feel free to share your progress with us in the comments or by linking up. Dana–Somehow it is worse with girls. There are so many cute clothes! I didn’t have this problem with my son, but now that I have two girls, I am definitely curbing the desire to shop. It is so much easier to just have fewer clothes to manage. Eliza–Thanks. I am going for simple living now, though I still have a long way to go. Your blog helps! WOW! Great job. It must feel so good to get rid of that. I also have two girls. I get struck saving everything too instead of being more picky.